Joe Koufman recently shared with me an initiative he’s spearheading to provide coats for people in Atlanta experiencing homelessness. I asked if he would share his story on my blog. If, like me, you’re inspired to help after reading this, please email him at koufman AT gmail.com (written that way so the spam bots don’t send a billion emails to Joe by end of day). My mother, who still lives in the town where I grew up – Winston-Salem, NC, was inspired by something she saw on the internet. I am hoping it inspires you, too! This article about my mother ran in the Winston-Salem Journal in January 2019. On Saturday, February 9th Michelle, J & R, and I drove around to three different Goodwill Stores to purchase as many warm coats, fleece, vests, and a few hats and gloves as we could find. All-in-all we ended up with around 30 warm coats, vests, and fleeces. 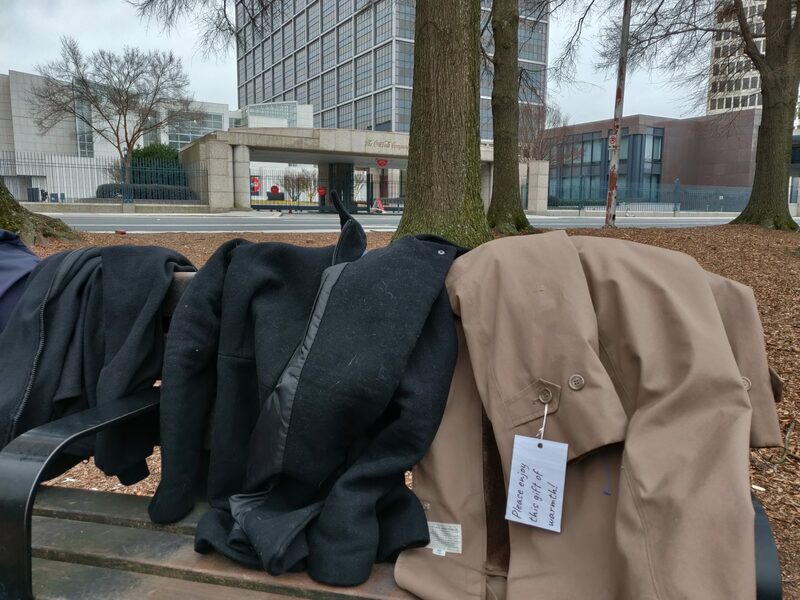 On Sunday, February 10th (on a cold and windy day) we drove around to some areas that we suspected were populated by people who are homeless to leave the coats where they could be easily found. The first place we visited was the Atlanta Day Shelter for Women just off of Northside Drive on the Westside. We were surprised when we pulled up to find around 10-12 tents outside of the shelter gate. R and I got out of the car and approached a woman sitting outside one of the tents in a folding chair and asked her if she could use a coat. She said “yes” and asked if we also had one for a man. He popped his head out of a tent, saw our coats, and asked if he could have THAT one. I said – “of course, here you go.” After a few minutes chatting with the woman and man, several other women approached us and asked if we had coats for them also. One woman came out of a pretty beaten-up car – where she clearly lived – and asked if we had a coat for her. We ended up leaving them with about 10 of our coats and some hats, gloves, and scarves. The second stop we made was near Georgia Tech in a park across the street from the Coca-Cola Headquarters. Michelle mentioned she had often seen people experiencing homelessness frequent the park. 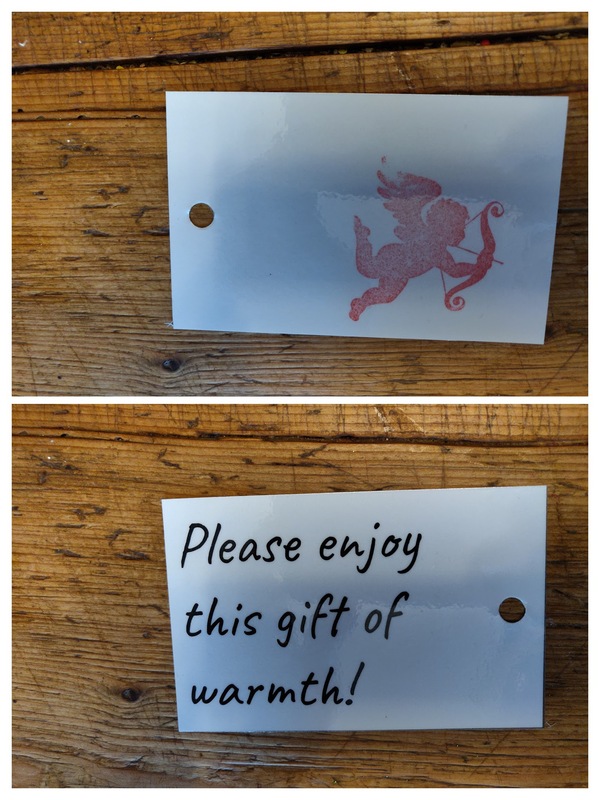 Here we decided to leave 6-7 coats with the hang-tags on a few benches. We were confident that people who needed them, would find them. Our third stop was next to the Atlanta Mission: The Shepherd’s Inn which is just steps away from Centennial Park including the Georgia Aquarium, World of Coca-Cola, College Football Hall of Fame, the Center for Civil and Human Rights, the Children’s Museum of Atlanta, and other Atlanta attractions. 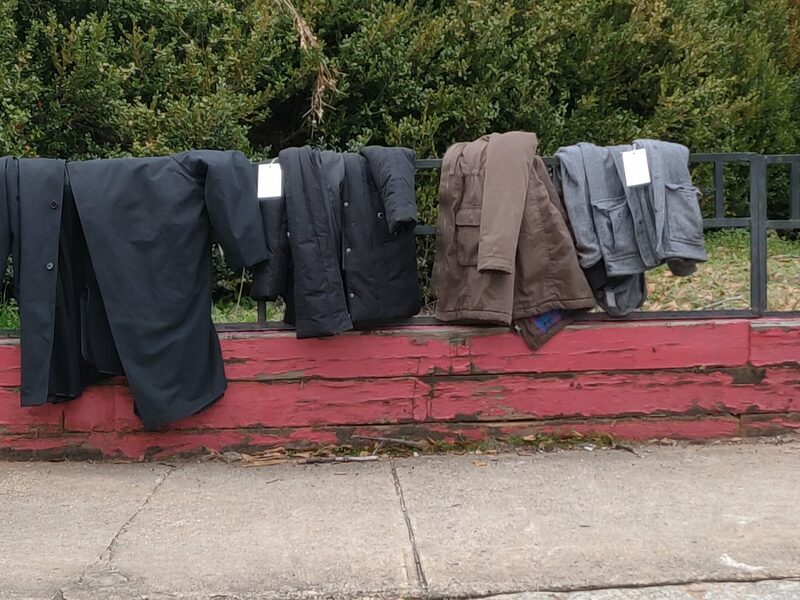 There was a short fence right outside of the Mission that was a perfect spot to leave some coats. It was a powerful experience to show our kids that you can make a very direct impact on helping others in need. Both kids seemed moved by the appreciation of the people we impacted. Here is my plea: I would like to do this again and again. Both my kids also got excited about the idea of launching a coat drive, so it begins NOW! Do you have a winter coat that you no longer need? Hats, gloves, scarves? Give them to me. I will make sure they get into the hands of someone who can really use them.